Your life purpose is not &#145;out there, somewhere,&#8217; waiting to be discovered. Your destiny is not lost, and it&#8217;s not missing. It&#8217;s not waiting to be found; it&#8217;s waiting to be released! You are divinely hardwired with destiny on the inside of you. It&#8217;s time for you to stop looking for purpose and instead, start doing what you were created for through the power of God. Prepare for a life-changing collision with God&#8217;s supernatural power and discover the secret to fulfilling life purpose today! 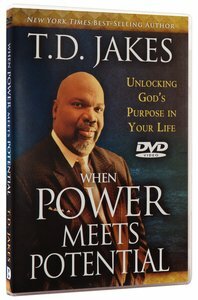 About "Power For Living: When Power Meets Potential (Dvd Study)"